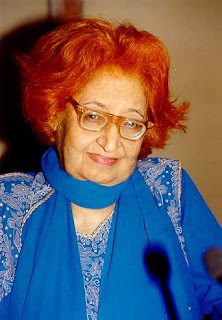 One of the greatest litterateurs of the 20th century, Qurratulain Hyder, who is best known for her novel Aag ka Darya (River of Fire), died at the age of 80. She was ill for sometime and was admitted at the Kailash Hospital in Noida (Delhi). Ainee's demise has come as a big loss to the world of literature. She was the most towering figure in Urdu fiction and was awarded Padma Bhushan apart from the prestigious Jnanpith and Sahitya Akademi awards. She was born in Aligarh in 1926 though her hometown was Nehtaur in Bijnor district. Her father Sajjad Hyder Yaldaram and Nazar Zahra, both of them werewell-known writers and influential personalities of their time. That's how the novel begins in the 4th century BC and traces the entire 2500 years of Indian history to finally end in 1956, seven years after the partition of sub-continent. When it was published, the astonishing sense of history, the vast canvas of the novel and Hyder's understanding of the idea of civilisation, had amazed the readers and critics alike. The characters like Gautam, Hari Kishan, Kamaal, Champa, who appear in various eras under different names (like Abul Mansoor Kamaluddin, Nawab Kamal Reza Bahadur and Kamal Haider), are taken away by the tide of time and then reappear. Her genius lies in the description of cities like Benares, Lucknow, Bahraich (Shravasti) and when she recollects the past and people in a particular period of time. She is equally at ease writing about Nawabs, Maharajahs and feudals, as she is about folk singers of Bengal, the fakirs, the phaeton pullers, boatmen et al. The ordinary human beings through whom she explores the world. 'In a cool grotto Gautam chances upon Hari Shankar, a princeling yearning to be a Buddhist monk. He falls in love with he beautiful, sharp-witted Champak. And thus begins a magnificent tale that flows through time, through Magadh, Oudh, British Raj, into time of Independence. The story comes full circle in post-Partition India when Hari Shankar and his friend Gautam Nilambar Dutt meet in the grotto in the forest of Shravasti, and mourn the passing of their lives into meaninglessness, their friends, who have left for Pakistan, and what remains of their country. It is believed that one of the character of the novel Champa Ahmad, who never marries, after Kamaal leaves the country, is none but Qurratul Ayn Haider herself. This is another of her major works. This novel is set in Bengal and runs along side important historic moments and periods like the rise in nationalistic feelings, the growth of revolutionary movements in Bengal, independence of the country along with partition, the demand for Bangladesh and ultimately the creation of the new country. The novel set in Oudh, depicts the changing order as the fedual system is giving way to a new society. Kunwar Irfan Ali is a staunch believer in traditional values and culture while Rakhshanda doesn't want to cling to the old set of ideas and is keen on adapting to the new culture. The story starts from the period of first war of independence (mutiny) and continues till the ninth decade of twentieth century. It is especially important as it depicts the social changes in the century, with a woman at the centre-stage and her perspective at the turn of events. When rural folk were suffering, the soldiers were rebelling and there was disillusionment, the elite of Zamindars and rulers of princely states, were making merry at the cost of their suffering subjects, and supporting the British Raj. Again this novel is set in Lucknow. The story of two families. In the Teen Katori House, the family is ultra-modern but at the same time, feudalism flows in their blood. The other family living in Red Rose House is no different. Qambar Miyan is a communist but when it comes to class consciosness, he is no different from a feudal lord. The third family belongs to those working in a 'nautank' (street theatre) company. Safeena-e-Gham-e-Dil focuses on freedom movement. Her other famous works include 'Dilruba', 'Agle Janam Mohe Bitiya na Kijo' (Don't make me a daughter in the next life), Sita Haran, Chai ke Bagh, are mostly on the social status of women. Annie was just six when she had written her first story. Another of her story 'Bi Chuhiya' was published in the kids' journal Phool (Lahore). She had spent her initial years in Port Blaire (Andaman and Nicobar islands), later studied at Dehradun, the historic Isabella Thoburn (IT) College at Lucknow and School of Arts London. There was a strong tradition of learning amongst women in her family that had come from Central Asia. Her ancestor Hasan Tirmizi had settled in Nehtaur in UP. Even her great grandmother Syeda Umm-e-Maryam had translated Quran into Persian. Her father Sajajd Haider Yaldaram was a celebrated writer of his era. Her mother Nazar Sajjad Haider had published her first novel Akhtarun Nisa when she was just 14 in 1908. Ainee's initial stories were published in Humayun. After partition she lived in Pakistan for sometime where she served as Information Officer for the ministry and later made documentaries. But following the publication of Aag ka Dariya and the controversies over her outlook regarding the partition of the sub-continent, Hyder returend to India in the early 60s. She joined Imprint as an editor in 1964 and later Illustrated Weekly of India between 1968 and 1975. In 1967 she got the Sahitya Akademi award for her collection of stories 'Patjhar ki Aawaz'. the same year her mother passed away. In 1969 she got the Sovietland Nehru Award. In 1984 Ainee was honoured with Padma Shree and Ghalib Awards. The highest literary award of the country Jnanpith was conferred on her in 1990. Until then only Firaq Gorakhpuri had got this award and after her Ali Sardar Jafri received it. Hyder had tranlated (transcreated) Aag ka Darya, (River of Fire) a few years back. (Thanks to Nand Kishor Vikram for chronological records). See more about Annie at my other site Urdu India. Raju Bharatan's informative tribute at Rediff is here. They worked together at Illustrated Weekly. The same site has Javed Akhtar's audio tribute. Sometime back Raza Rumi wrote the post 'Conversations with renowned author Qurratulain Haider' at IndianMuslims.in here. Reyazul Haq has also posted his tribute at his blog Hashiya. 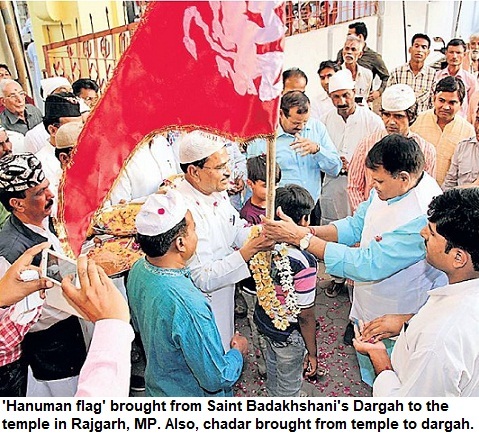 Sectarianism amongst Muslims in Gujarat!